Tag line: "A Blood-dripping Brain Transplant turns a Maniac into a Monster..."
Director Al Adamson’s Brain of Blood has a lot of common with his low-budget monster mash-up, Dracula vs. Frankenstein, which was released a year earlier. Like that film, Brain of Blood features weak production values and less-than-stellar performances, but what the movie lacks in technical savvy, it more than makes up for in sheer strangeness. Amir (Reed Hadley), the beloved leader of a middle-eastern country, is dying. Fearing his demise will plunge their society into chaos, two of Amir’s closest advisors; Bob (Grant Williams) and Mohammed (Zandor Vorkov), seek the help of American scientist, Dr. Lloyd Trenton (Kent Taylor), who believes he’s perfected a medical procedure that will allow him to transplant Amir’s brain into another man’s body. Aided by his dwarf assistant, Dorro (Angelo Rossitto), Dr. Trenton successfully removes Amir’s brain, but when the body his deformed servant, Gor (John Bloom), returns with proves an unsuitable host, Dr. Trenton decides to take matters into his own hands. The movie’s first few scenes, where Amir’s body is brought to Dr. Trenton’s lab, tell us everything we need to know about the type of film Brain of Blood is going to be. To start with, the picture was done on the cheap, which is obvious the moment we realize Amir’s henchemn have “preserved’ his body by wrapping it in aluminum foil! To coincide with the overall shoddiness of the production, Adamson occasionally positions his camera in such a way that we have no idea what’s going on (in one ill-advised move, he swings it behind some glass beakers resting on a table in Trenton’s lab, turning what had, moments earlier, been a clear image into a distorted mess). Yet, thanks to the bizarre twists its story took, I was able to overlook many of these faults. For example, the dwarf, Dorro, has to stand on what looks like a dining room chair to see the operating table, and Dr. Trenton keeps two women chained up in his basement, solely to serve as his own personal blood donors. And that's just the start of it; this movie gets more peculiar with each passing minute! 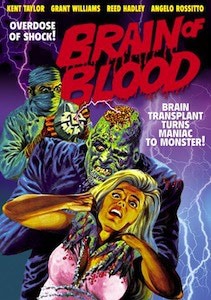 In short, Brain of Blood may not look all that great, but it’s certainly weird enough to grab your attention.